Below are some of the member's stats. Cumulative Stats of contributing members. Tom Brian was recently part of a small group of Metros at the IAAF World Half Marathon Championships in Valancia and has shared his expeiences as a race blog. 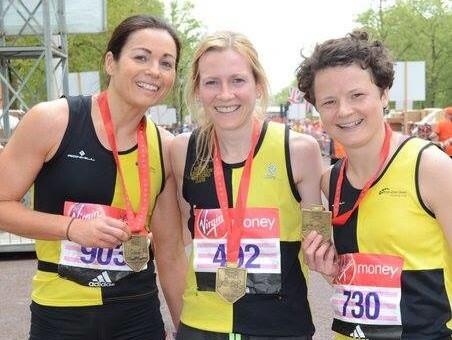 Fiona Brian led the Metro Aberdeen women's squad to an unprecedented and historic double gold medal-winning success in the London marathon. The team results have only now been officially released and show that the north east side overcame opposition from all over the country to win both the British and Scottish team titles. Brian was fifth Scot and 27th overall in the non-elite division of the race with a personal best time of 2hr 53min 50secs. That's a big improvement on the 3:09:20 she clocked on her debut in the UK capital twelve months earlier. Her clubmates Jennifer Elvin and Hazel Wyness also produced sparkling performances to secure the top prize. Elvin finished 30th in 2:54:41 which was a big step-up from her previous best of 2:57:16 set when finishing sixth at San Sebastian last November. It's the second year in a row that Elvin has picked up a British championship medal having been in the Clapham Chasers side which collected bronze behind Windsor and London Heathside in 2016. Wyness, who recorded 3:09:56 for 10th position at Florida's Walt Disney World marathon in January, ran under the three hour mark for the first time with a 2:56:28 performance for 43rd spot. The combined time of the three Metro runners gave them top billing ahead of Kent AC with Dulwich Runners taking the bronze medals. It's the first time a Scottish club has won the British title and Brian was delighted when the result was confirmed. "I couldn't believe it when we realised we had won." She said:"It's incredible. I couldn't believe it when we realised we had won. I don't think any of us had paid attention to the team prize before the race, certainly not as far as the British championships were concerned. I just presumed there would be quite a few clubs who would be ahead of us in that. "The Scottish title was, I suppose, always a possibility but it was only a few days afterwards when we started looking through the results that we realised we might have a chance of both. "It takes quite a bit of time for the team results to be confirmed so it has been a bit frustrating having to wait for it to be officially announced. "I was pleased with with my own run although I was hoping to be a little faster. I was so pleased that Jennifer and Hazel also produced impressive performances. "I am just really happy to be part of the team that has done so well, especially as we weren't expecting it. It's right up there in terms of anything I have done in athletics. I never thought I'd ever be part of a British championship-winning team. It's just so good when it all comes together and everyone does well."